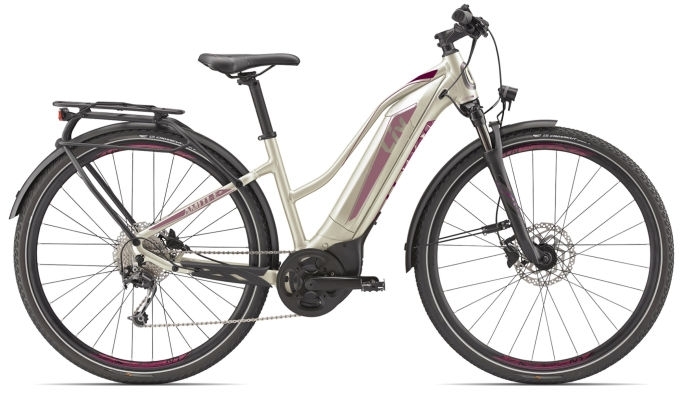 Set your sights farther, get back on a bike and fit more awesome in your day with the motor-assisted Amiti E+ electric bike. Using Liv’s 3F Design Philosophy, Amiti E+ was designed for a woman’s comfort and taste. The bike provides a lower stand over height, facilitating getting on an off the bike. Amiti E+ is equipped with a solid braking system for loyal traction, an integrated day light on the head tube, fenders and tubeless tyres for optimal comfort and safety. The handlebar-mounted control lets you adjust riding modes, and it has key data indicators – battery level, support level, speed and distance. Amiti E+ offers three levels of assistance for speed control, Eco, Normal and Sport, which add 80%, 180% and 300% of your power to your pedal stroke. This bike can take you from city streets to rough country roads seamlessly.